100,000 acres of Off- Project Ag land have already been taken out of production. * Rural Cleansing by Kimberley A. Strassel, Wall Street Journal 7/26/01. There is a rush to get an agreement and legislation in the next few weeks to provide millions of dollars to destroy the dams, give land and money to the tribes, permanently downsize ag, and possibly get affordable power rates to irrigators. Contact your representatives with your opinions! Klamath Tribes drop ESA lawsuit against BOR. Merkley to hold PRIVATE Sucker Recovery Summit November 16 in Klamath Falls, H&N 11/9/18. CORRECTION: In the article below, Capital Press edited out 1/2 of Mallam's sentence. The sentence should read: "Modeling experts have also examined OWRD's modeling and their analysis actually includes the word 'fraudulent.' " Capital Press left out of the sentence: "...and their analysis actually includes the word 'fraudulent.' "
KLAMATH BASIN: Oregon state agencies out of control, by Tom Mallams for Capital Press 10/13/18. "Their computer model claims wells interfere with surface water, if the well is within one mile of any waterway. This year’s shutoffs include 2 wells for the city of Klamath Falls, all of Bly and all of Chiloquin. Also shut off are many wells used for irrigating crops, watering livestock and some homes that use spring water. Additionally, wells used for major businesses including Jeld-Wen, Running Y Ranch Resort and Harbor Links golf course were issued shutoff notices. Each year, the number of wells being shut off grows...Problem is, OWRD, when pressured, actually admitted that the one mile number could be expanded...you are automatically deemed guilty unless you prove your innocence. Not exactly what the Constitution says. The way OWRD modeling is framed, it is literally impossible to prove your innocence. OWRD even admitted that this is indeed the case...Thousands of Oregon businesses and citizens will be denied their ability to survive in this openly hostile state governmental environment..."
State water actions taken without first determining what the actual facts are, by Senator Dennis Linthicum, Commentary for H&N 5/15/18. "Scientific examination would clarify that some wells do impact surface waters while others do not. OWRD seems to suggest that in all cases, at all times, and in all circumstances, groundwater wells impact surface flows...OWRD ought to know with certainty that an individual well is harming a senior water right-holder, before shutting-down specific water resources..."
The State has turned off all of our water including our wells! by Brandan Topham, Sprague River, Newsletter 5/7/18. "Most of the irrigation wells have been drilled since 1950...we have river data for 32 years before the wells were drilled. In those 32 years the average flow is 860cfs. Since 1951 the average flow is 1052cfs. That means since the wells have been drilled there is almost another 200 cfs in the rivers. That does not sound like the wells are drying up the rivers...Every few years they keep changing the rules to shut off more stuff. This year they figured out how to shut off ~140 wells in addition to what they have been shutting off in the past for the Klamath Tribes. Last year they shut off every thing even with river flows well above average..."
Letter from Ann SeCoy, Beatty, Oregon to Klamath County Commissioners, Oregon State and Federal Representatives & Senators regarding 140 Upper Klamath ag wells shut off, and responses from Senator Linthicum and Rep. Reschke 4/30/18. Tensions rise as OWRD regulates wells in Sprague River; 35% revenue loss expected in Upper Basin, H&N 5/2/18. "...More than 80 notices to shutoff groundwater wells within up to a mile of surface water in the Upper Basin. Up to 114 of the 140 known wells in the area could be regulated...'They were regulated last year even though we had 140 percent of snowpack.' "
* Klamath Tribe document of intensions - putting land into tax-exempt trust, ...intends to "buy back private lands....and secure funding for purchasing retired water rights, conservation easements...assert tribes senior water rights...expand gaming...exchange for federal lands..."
* FYI: Klamath Tribe's Constitution: "...B. It shall be the policy of the Klamath Tribes to seek the return, to the Klamath Tribes, of all lands, natural and cultural resources, including minerals and water rights that become available and which were historically a part of the Klamath Tribes heritage C. All waters which originate in or flow through the Klamath Tribes jurisdiction, or which are stored within the Klamath Tribes jurisdiction, whether found on the surface or underground, are a valuable Tribal resource of the Klamath Tribes, and are to be protected for the present and future use of the Klamath Tribes..."
Upper Basin water: Talk or litigate? Which? Let's talk, by Randall Kizer for H&N 5/21/17. "The Wood River’s bank are full of water and, yet, the valley’s irrigators are shut off due to a call of (Klamath) tribal instream water rights...We agreed to just about everything the Tribes demanded...upper basin landowners have agreed to retire thousands of acres of irrigated land and built thousands of feet of fencing along streams, rivers and creeks...The Tribes are angry. They were promised funds for economic development, land in the Mazama Forest and dam removal in the KBRA..."
(Klamath) Tribes call for agreement termination, H&N 5/18/17. "At a minimum, Gentry said any framework for a settlement proposal must adequately address treaty resource reintroduction, restoration and protection resulting in sustainable and harvestable treaty resources that will support the meaningful exercise of treaty rights. 'This must include return of homelands and co-management of land and resources that affect treaty resources...' "
Tribal chairman defends water call, H&N 4/30/17. "Ranchers in the upper basin have criticized the call, claiming they will have a short window to irrigate and water their cattle this spring, and they have no water available the rest of the summer. Some believe this call could put them out of business....“We're just asking for justice,” Gentry said. “We're just trying to hang onto what has been reserved by treaty despite what has happened to us..."
OWRD responds to Tribes' call on (Klamath) water, H&N, 4/28/17. "I’m very disappointed that this call has been initiated by the Klamath Tribes and validated by the Oregon Water Resources Department at a time when our rivers are literally running over their banks,” (State Rep. E. Werner) Reschke said in a statement. “This decision negatively impacts farmers and ranchers up and down the basin and defies conventional logic. Oregonians lose when we allow one group to exercise exorbitant control over the rights of others..."
* Upper Klamath irrigators response to Klamath Tribes Negative Notice sent to DOI to end UKBCA 4/28/17. Tribes Issue Water Claim, Ranchers Fear the Worst, H&N 4/23/17. "In April 2014, ranchers and the Tribes signed the Upper Basin Comprehensive Agreement. The ranchers agreed to retire 18,000 acres of land or 30,000 acre feet of water and do riparian repair work on the rivers in exchange for an allotment of water each year…At the end of February, the Tribes indicated to the ranchers they wanted to terminate the agreement..."
(Klamath) Tribal water call: 'Devastating.' Ranchers in the upper basin react to water call, H&N, 4/19/17. ***Dozens of Sprague River wells shut down by Klamath Tribal call on irrigation water, Senator Doug Whitsett 7/28/16. "40 wells Oregon Water Resources Dept. plans to shut off this year. (So far)" This was sent to KBC 7/14/15. These are Upper Klamath Basin Wells. Brandan Topham February Newsletter - OWRD to shut off surface and ground water to Upper Klamath ranches and farms, posted to KBC 2/23/14. "The State recently told us that they are going to shut off all of the surface water above Klamath Lake again this year....(OWRD) has decided that it will also shut off most of the wells above Klamath Lake." Letter Virginia Topham from Sprague River wrote to Oregon Water Resources Director Phil Ward who will shut off Upper Klamath irrigation wells, February 2014. "Why are we being targeted for destruction? Your own people testified that they have no way to prove that we are interfering with surface water. In the prosecution of the Nazi war criminals at the Nuremberg trials after WWII their only defense was that 'they are just following orders.' "
< Oregon Senator Doug Whitsett and Rep. Gail Whitsett Science of shutoffs, well water monitoring law aims to clarify ownership, H&N 2/7/14. “We fully support the OWRD authority to regulate wells that are materially interfering with senior water rights. However, we believe the state should be required to prove that the use of irrigation wells is materially and measurably harming a water right holder with a superior priority date,” Gail Whitsett said." 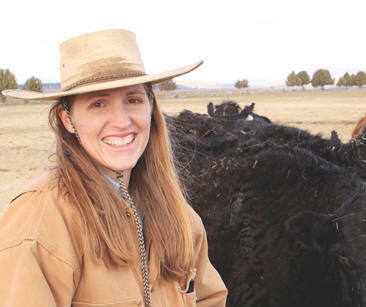 2013 a costly year for Upper Basin ranchers, H&N 1/2/14. "Like other Upper Basin ranchers, Duarte’s water was shut off this year ... when the Klamath Tribes and Klamath Project irrigators made calls for water in early June. That meant all the Upper Basin ranches went without irrigation water this summer. 'We’ve got a $90,000 hole in our account this year...' "
Water issues will likely dominate session work, Senator Doug Whitsett, posted to KBC 12/31/13. "The Oregon Water Resources Department has made clear its intentions in 2014 to shut down as many as 130 irrigation wells due to alleged interference with surface water rights...."
Klamath County Water Crisis by Heather Smith Thomas, Western Montana Water Rights, posted to KBC 11/23/13. "One of the most devastating government “takings” in the history of the U.S. is in progress in Klamath County, Oregon. This movement to get farmers and ranchers off their privately owned lands has been brewing for many years but came to a head after a sequence of events this spring and summer shut off long-time water rights and deprived landowners of their ability to irrigate or water their livestock." 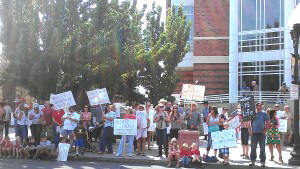 (Klamath) Racism and Land Theft, Oregon-Style, by Erika Bentsen, posted to KBC 8/28/13. "What does this mean to the future of Klamath County? Are tribal members going to be the only ones allowed to own land? Now that irrigation is taken out of production, property values are plummeting. But only tribal members will be compensated; all others will be bankrupted. Who gets the land next? Will the tribes buy it for pennies on the dollar? Then what? Will the water in the rivers no longer be called, like it was before the tribes sold the reservation?" No water, no cattle. Shipping out: Cattle moved from Modoc Point. Without water, ranchers cannot feed cattle in the upper Basin, H&N posted to KBC 8/28/13. Science of (Klamath) fish mortality should be challenged, by Jerry Jones, Chiloquin H&N, posted to KBC 8/28/13. "Most of the summer is gone with no resumption of water deliveries to Upper Basin irrigators...The state and federal governments conspired with the tribes to create this problem and destroy the opposition to the Klamath Basin Restoration Agreement..."
Latest Klamath water crisis continues century of conflict, Capital Press, posted to KBC 8/23/13. "Nathan Jackson, a Cow Creek Indian who manages his family's ranch near Bonanza in Klamath County... said...the Klamath Tribes have "asked for an unreasonable amount of water to support their hunting and fishing rights." He said the quantity of the tribes' water call is "decimating the entire industry in the Klamath Basin.' 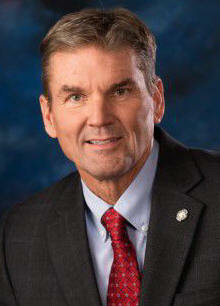 "
Chamber stance wrong on KBRA support, Virginia Topham for H&N posted to KBC 8/19/13. * The Oregon Water Resources Department is no longer a friend of agriculture. 8/1/13. "More than 250 water users holding Allottee and Walton water rights dating to 1864 are being forced to turn off their irrigation water...The Department’s final determination gave the Tribes such a huge amount of water that virtually no additional water will be available for irrigation in a normal year..."
< Klamath Water Crisis, by Dani Nichols, posted to KBC 7/22/13. "...Here are the basics: the Klamath Tribes and the environmental activists have teamed up to starve farmers and ranchers out of the Klamath Basin, because of the lives of the supposedly endangered sucker fish in Upper Klamath Lake, and the Coho Salmon of the Klamath River. Because the tribes have been in the Klamath Basin since “time immemorial”, a judge recently ruled that their water rights supersede those of the Klamath County Agriculturalists. What are the tribes doing with these newfound rights? Turning off water to agriculture, the main industry of Klamath County (plus a threat to refuse multi-use water to Crater Lake National Park, the only National Park in Oregon and a revenue generator of more than $30 million for Klamath county and the surrounding area last year) and letting thousands of gallons of economic and cultural force drain to the ocean instead..."
Upper Basin water shut-off newsletter by Brandan Topham, posted to KBC 7/12/13. "The day after the rally we were in district court in front of Judge Wogan, asking for a stay so that we can resume irrigating while this is fought in court. It was a bit demoralizing when a person goes into the courtroom and there are 3 lawyers trying to help agriculture and there are 16 lawyers from the tribes and government fighting very hard to keep the water turned off. 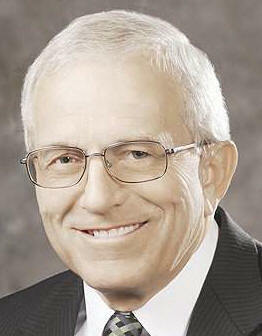 .."
H&N POLL 7/10/13 - Water shutoffs: What should Circuit Court Judge Cameron Wogan do? KBC News 7/3/13 - On Monday nearly 1000 farmers, ranchers, and concerned citizens came together to plead for water for 114,000 acres of land supporting cattle, pasture and alfalfa. The original order prohibited farmers and ranchers to use water for human consumption and livestock watering. Some ranches have been in the families since the mid 1800's. The blackmail was, if the off Project irrigators would sign an agreement, The KBRA, further downsizing irrigated agriculture and gifting land to the Klamath Tribes, then the Tribes would not shut off their water which they claim will produce more suckers. The vast majority of the communities oppose this "agreement" in which they were allowed no input. 100,000 acres of Off- Project Ag land have already been taken out of production. 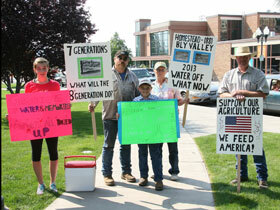 Water shutoffs to continue; Judge denies temporary stoppage on Klamath Basin adjudication enforcement, H&N 6/15/13. "If they cannot feed their livestock, ranchers will be forced to sell..."
Klamath area ranchers cope with lack of water, followed by Watermaster, rights determine haves, have nots, Capital Press 7/2/13. Water rights secured for livestock and human use in Klamath County; Oregon Water Resource Commission adopts temporary rules granting water rights preference to livestock watering and human consumption in Klamath Basin. Oregon Cattlemen's Association 7/1/13. However, they are still prohibited from keeping their crops and pastures watered. Crater Lake shutoff possible, H&N 6/30/13. "Any impacts to Crater Lake could be far-reaching economically. In 2011, visitors contributed $34.6 million to nearby communities, said Jeff Olson, National Park Service spokesman, and 549 area jobs were supported...Calls for water were made June 10 by the most senior water rights holders: Klamath Project farmers and the Klamath Tribes." 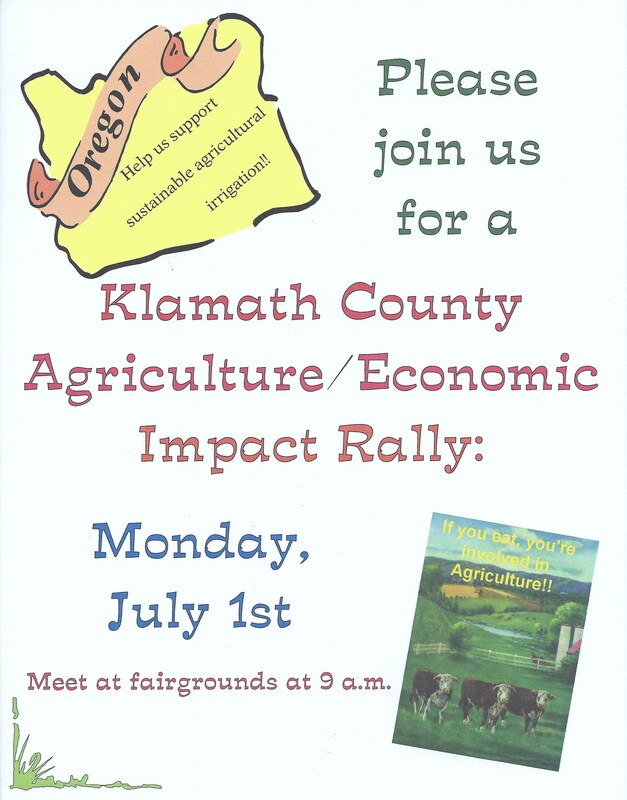 Klamath County Ag Impact rally Monday July 1 at 10:00 a.m. Who are we, and economic impact of current water shut-off to dozens of farmers and ranchers in the Upper Klamath Basin, 6/25/13. Klamath water cutoff will impact wildlife, My Outdoor Buddy by Frank Galusha, posted to KBC 6/26/13. 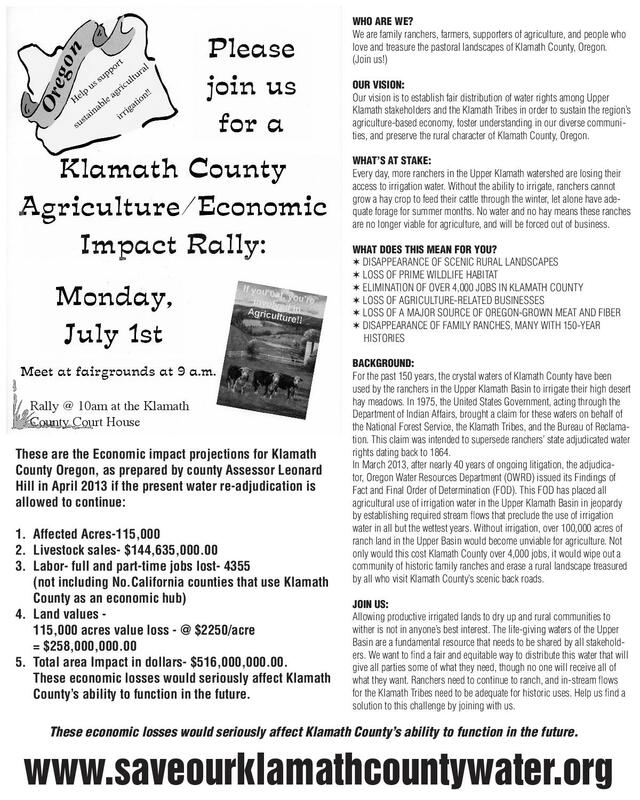 Who are we, and economic impact of current water shut-off to Hundreds of farmers and ranchers in the Upper Klamath Basin, 6/25/13.